It turns out that the coffee powered car hasn’t yet made the trip from London to Manchester, this is happening tomorrow, and the car actually runs on used coffee grounds, so I guess it wouldn’t be all that expensive to run after all. 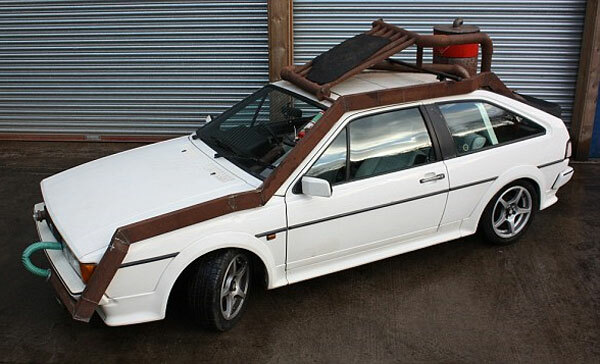 The Car-puccino is a car that runs entirely on coffee, it was built by the team from the BBC science program ‘Bang Goes The Theory‘, using an old Volkswagen Scirocco from 1988, which was bought for £400. The car runs completely on coffee granules, the granules are out into a gas cylinder and then heated to 700c in a charcoal fire which makes the coffee break down into hydrogen and carbon monoxide. The gas is then fed into some radiator pipes that are on the cars roof and it cools down. This gas is then fed into two filters which are inside the boot of the car, one is a cyclone filter which removes any solid matter, and the other filters out the hot tar and stops it getting to the engine. The clean gas is then fed to the engine, where it burns and powers the engine. The team who invented the car have managed to drive it 210 miles from Manchester to London powered only by the roasted coffee granules, although it seems it could be an expensive way to travel costing around 56 espressos per mile.